Remember, can you recall my Mutton Kurma? I hope you can. Otherwise, just flip flop over to the recipe. Otherwise, give me a break please. I don't want to get down to the nooks and cronies on explaining what is kurma, aka, Indian vegetable curry (Indian Vegetable Curry, Cauliflower Curry & Indian Tofu Curry). So, no need for me to explain what is kurma right? This kurma curry, an absolute fab, don't you think so, yes, you have to make the kurma from a stretch. Kurma paste by far, unless you prefer store bought kurma powder? Up to you actually. But we shouldn't discount home made kurma paste right? Nothing like making right? Of course for this Vegetable Kurma. Kurma paste, potatoes, long beans, brinjal, spices and aroma of coriander leaves (Creamy Coconut Lentil Curry, Bitter Gourd Sambar, Mor Kuzhambu, Tanni Saar, Sambar, Sodhi & Spinach Dhal Curry). Sounds fab? I reckon. Add blended paste, stir and cook till aromatic and oil splits. Put in chilli powder, turmeric powder and lemongrass. Add potatoes, brinjals, salt and 1/2 litre of water. Put in beans and simmer for another 4-5 mins. When veggies are soften and tender, remove from heat. Gently stir in yogurt and coriander leaves. I love nutty taste of poppy seeds and do use in some of my meat gravies.good idea to use in vegetables,too. I love kurma, and this sounds like a beautiful rendition. I've never made kurma at home and need to try this. I love the color tumeric gives everything--what a great-looking vegetable dish! Eggplant and potatoes do make a great pairing in this curry dish. Also, great to find a curry recipe with poppy seeds-this is the first I have seen of it. This dish has such a myriad of flavors, I am sure it is very satisfying. Also the hue is very eye catching. Great post! Vegetables and spicy curry? YUM! It looks amazing! Thank you so much for all the sharing and comments everyone. Appreciate each one of it. This looks fantastic, I love kormas! I love the vegetables in this curry. Looks delicious! 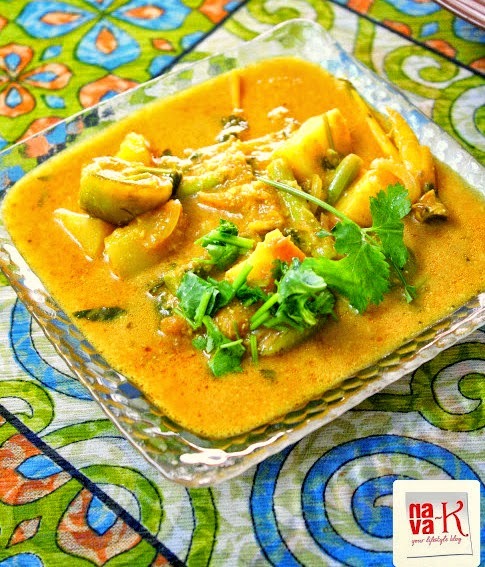 A very nice Kurma with a different combination of veggies!! i like the creamy flavour! !